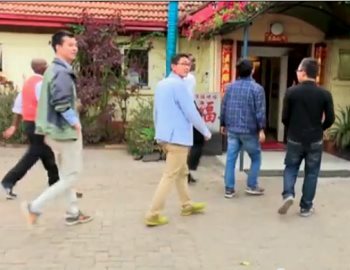 AFRICANGLOBE – More than 100 Kenyan youths removed electronic items and goods from the Chinese Chongquing Restaurant in a protest against its ‘no Africans after 5pm’ policy on Friday. They lit a fire in its compound after their march to its location at the junction of Galana and Lenana roads in Kilimani, Nairobi. Kilimani MCA Moses Ogeto said the youths had a right to protest, but admonished them for taking the items of unknown value. “Picketing and demonstrations are enshrined in our constitution but we should not let it go to the point of looting and destroying other people’s property,” he told reporters. Area OCPD Peter Kattam said an investigation into the incident will be launched. 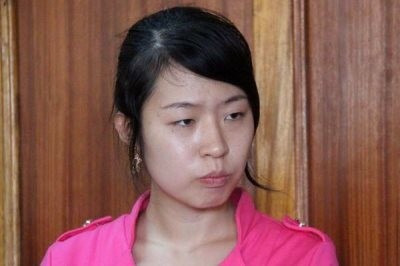 Restaurant manager Esther Yang was charged with operating it without a tourism license at a nairobi court on Thursday. Yang was also accused of engaging in the business without a work permit. She denied the charges before senior resident magistrate Miriam Mugure. She was remanded to Lang’ata Women’s Prison until Monday when she will apply for bail. If convicted, she is liable to a fine of not more than Sh100,000 or 18 months imprisonment, or both. The restaurant reportedly served dogs to its customers. Interviewed employees further said it served as a brothel and was in deplorable condition. County Governor Evans Kidero shut it down on Tuesday and said it will remain closed until the owners comply with all regulations. 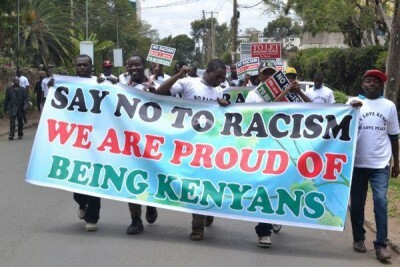 In a statement on Thursday, the Chinese Embassy termed the policy “unacceptable and inexcusable”. The embassy cautioned all other Chinese business owners in the country saying they will be penalised if they enforce similar policies.